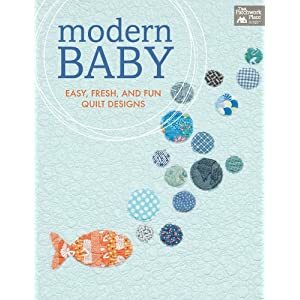 Happy Quilting: Modern Baby - A New Book!! EEEkkk!! I am so excited to share, this has been a secret for a long time!! I have a quilt in a new book that will be released in April called Modern Baby!!! Double EEEkkk!!! Martingale has gathered an amazing group of quilters to create this diverse collection of modern baby quilts. The designers include Amy Smart, Audrie Bidwell, Carolyn Friedlander, Carrie Bloomston, Dana Bolyard, Jake Finch, Jen Eskridge, Lindsey Rhodes, Melissa Corry, Pippa Eccles Armbrester, Sarah Flynn, Shea Henderson, and Victoria Findlay Wolfe. Ya, can I just say I am so honored to be among this group! Here's my project, It's called Daddy's Little Girl. ( I can't believe I finally get to share this, so excited!!!!) I had a lot of fun designing this quilt. My design concept was to take a basic chevron (totally modern, right) and then create a sort of moving background for it so that you don't quite know if it is moving up and down, or across. I love the boldness of the black and white prints but yet how the pink tones it down so that it is still soft and girly. I used prints from Doodle Bug Designs Tuxedo Collection for Riley Blake and the pink is Cotton Candy from Riley Blake's Shades collection. I did the quilting myself for this little project and I was so happy with it. I did a loopy flower and scroll vine design on the pink chevrons and I think it is some of the cutest quilting I have ever done. Ya, I am just a wee bit proud of it, can you tell?? I did straight line echo quilting in the background to really help give it that modern feel and to really make those pink chevrons pop!! So that's Daddy's Little Girl!! Modern Baby is now listed on Amazon, Barnes and Noble, and Shop Martingale and I have to admit, it still makes me giddy to see my name listed as an author there. So if you have a minute pop on over to one of these sites and check out all of the other projects in this adorable book!! Like I said before, I am in some amazing company!! Congratulations Melissa! Your quilt is just adorable. Great news Melissa....so happy for you! This is such a cute baby quilt and I really like how you quilted it....perfect for this design! congrats! your quilt is so sweet. How surreal for you! Congratulations! Do you get to keep the quilt? Congratulation! I love your choice of fabric and the letters on the side of the quilt. Congratulations Melissa - the quilt is adorable! 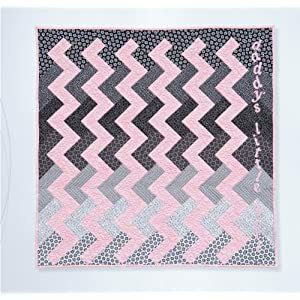 Fantastic job on the quilting esp the pink chevrons! Terrific! congrats! Oh wow. Your quilting is amazing! You are getting so good at this! How exciting!! Cute little quilt and your quilting is great! Congratulations! What a great baby quilt - perfect. Congratulations! Im off to amazon to buy it!!! Congratulations ! Too cute to pass by, I pre-ordered my copy for April delivery. Cangrats Melissa! I can see your quilt being made in so many different fabric choices! Congratulations Melissa!! The quilt is adorable! Congratulations! That is so so exciting and your quilt is great. Sew exciting! Your quilt pattern is precious! Very cool and congratulations. It makes me a tad sad that I don't have little babies any more. Congratulations, Melissa!!! It is a darling quilt and you did an AWESOME job with the quilting!! Yay for you!!! Congratulations! I just found you ... and now your are famous. Absolutely love the machine quilting. Congrats to you! Your quilt is adorable...great job! Congratulations. Your quilt is so cute!!! That quilting is absolutely precious! Oh Melissa Melissa Melissa. It's so very very very perfect and you should be giddily proud of it. I LOVE IT! Congrats! Beautiful quilt, and well earned publish! This quilting is sooo great! I hope one day I can do this! I love this ! Just saw this and a BIG CONGRATS to you !! :D I love the quilting on it ; did you do this on your regular sewing machine ?